By popular demand, the NEC® Spiralbound is here for the 2017 edition of the National Electrical Code®! NFPA 70®, National Electrical Code (NEC) presents the latest comprehensive regulations for electrical wiring, overcurrent protection, grounding, and installation of equipment. Order the NEC Spiralbound with a coated cover and multiple rings to hold pages secure. This convenient format opens flat for easy reference to requirements at your desk or on the job site. Five all-new articles and hundreds of changes in the newest NEC pave the way to a safe and efficient electrical future. Order your 2017 NEC Spiralbound today and be ready for any electrical project. You asked for the NEC® Spiralbound and NFPA® delivers! This 2014 NFPA 70®: National Electrical Code® format is ideal in the field or at your desk. The 2014 NEC® covers the latest requirements on electrical wiring and equipment installation issues, including minimum provisions for the use of connections, voltage markings, conductors, and cables. Chapters address specific circumstances surrounding special occupancies and industrial equipment and machines. It also contains specific details on the safe installation and use of communications and signaling conductors. Order the 2014 NEC Spiralbound, with a coated cover and multiple rings to hold pages secure. Order your 2014 NEC Spiralbound today and be prepared for any electrical project. Boost your referencing power with NFPA®'s best-selling NEC® Tabs for the 2017 edition of your NEC Code or NEC Handbook. Invest in this easy way to save time on every electrical job. 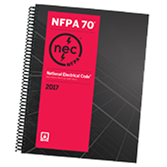 Self-adhesive NEC Tabs affix to the 2017 edition of the NFPA 70®: National Electrical Code® or NEC Handbook, so you can flip open your book to the latest electrical safety information.